MoistureShield® Infuse™ composite decking with CoolDeck® technology has been awarded an Architectural Products magazine Product Innovation Award (PIA) 2017. Judged by a panel of over 40 industry professionals, this award is given to products that excel in innovation. MoistureShield’s CoolDeck technology is the first of its kind, and is a much needed solution to homeowners’ concerns of composite deck surface temperature. MoistureShield’s CoolDeck technology optimizes heat reflection to provide a cooler, more comfortable deck. The boards absorb up to 35% less heat than conventional capped composites in similar colors, for a noticeably lower surface temperature in direct sun. Although any dark colored decking absorbs sunlight, and can heat-up, composites are denser than wood decking, leading to some products becoming too hot to touch. Hot decking limits time to enjoy the deck, especially for barefoot children and pets, both of whom have sensitive feet. This new technology allows for more time on deck, and minimizes the concern of walking barefoot on a hot surface. MoistureShield Infuse decking is made with 95% total recycled content (38% post-consumer, 57% pre-consumer), including recycled milk jugs, grocery bags, pallet wrap, waste pallets and construction debris. 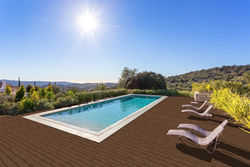 MoistureShield backs its Infuse decking with a transferable lifetime residential warranty, supplemented with a 25-year fade and stain warranty. As with other MoistureShield decking, Infuse can be installed on the ground, in the ground or even under water. Advanced Environmental Recycling Technologies, Inc., (A.E.R.T.) is part of the Architectural Products Group of Oldcastle, North America’s largest manufacturer of building products and materials. A.E.R.T is a vertically integrated manufacturer of composite decking boards and related products, serving a range of retail and distribution customers across North America and several international markets. The development of new technologies and patents has enabled A.E.R.T to manufacture superior composite products from recycled wood fiber and recycled polyethylene plastic for the building and construction markets. AERT’s products are sold under the ChoiceDek® (http://www.choicedek.com) and MoistureShield® (http://www.moistureshield.com) brands.